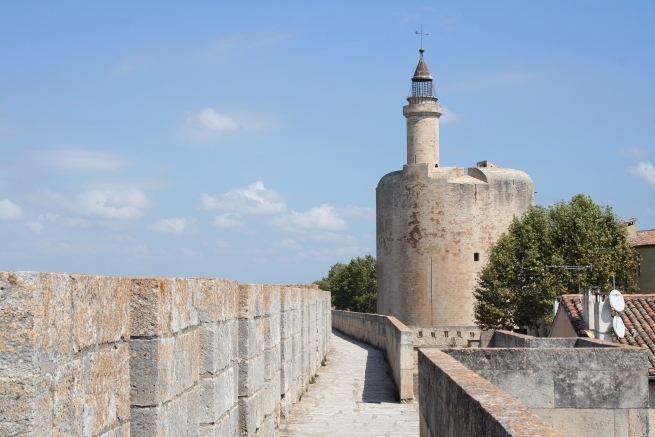 Lovers of history and castles should put a pin in the map at Aigues-Mortes, a town whose medieval centre is enclosed within rectangular ramparts, complete with circular towers and gateways and walls that you can walk along. Inside the grid layout of streets are lined with tourist shops but you can also explore quieter streets full of character and restaurants waiting to be discovered. Look out for the statue of Saint Louis. The town is famous on many levels: the historic and economic and also the natural or geographic plane. Firstly, the starting point for some of the Crusades was right here in front of the city, where the waters still reach, forming a perfect inland lagoon suited to harbouring the many vessels that gathered prior to the journey to the Promised Land. Pope Innocent IV called on the Kings of Europe in 1240 to retake Jerusalem. 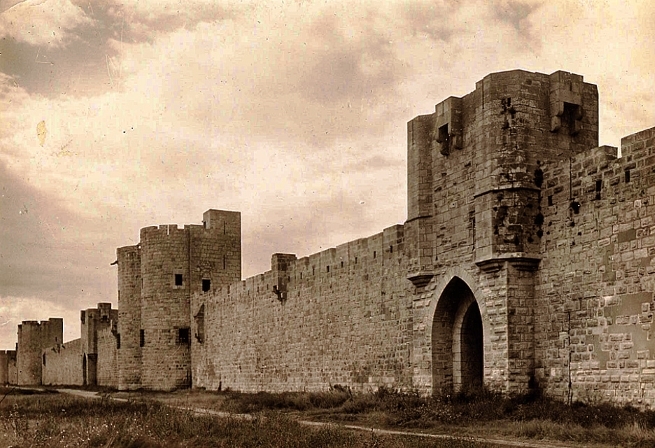 Louis IX took on the command of the expedition, and as he didn’t have a port in the Mediterranean, he chose Aigues-Mortes. At the time, Provence belonged to the German empire and Languedoc Roussillon belonged to the kings of Aragon. 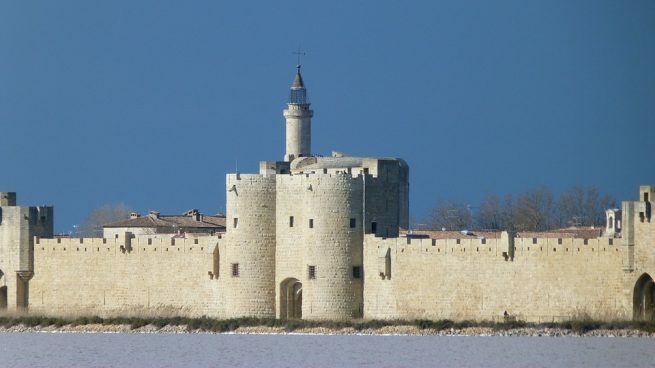 Aigues-Mortes was bought from the Abbey of Psalmody in exchange for land at Sommières, Louis being keen to gain some control over access to the sea. It was from here that crusaders gathered from all over Europe, including the United Kingdom, to set off on the seventh crusade in 1248. Louis had built up the town as a centre for trade with the East. On his next crusade in 1270, King Louis died of typhoid off the shore of Tunisia. The Tour de Constance, an impressive round tower adjoining the ramparts, is visible from a distance on approaching the town and is well-known in the region for its bitter role in the suppression of Protestantism in the seventeenth century, when it was used to imprison 15 – 80 Huguenots, mostly women. The most famous of these was Marie Durand who lived 38 years in the tower (1730 – 1768) and who is purported to have scratched the words “resister” on the castle wall. 16 died during incarceration. Escape was uncommon, but the chief of the Camisards (Huguenot fighters from the Cévennes) managed to escape in 1705. A visit is a must, along with a trip to the (Huguenot) Musée du Désert north of Anduze. In 1337 forty-five Knights Templar were incarcerated in the tower. In 1560 Helie Boisset was imprisoned for preaching Reformation despite its being outlawed. The governor of Aigues-Mortes who had welcomed him, was thrown into prison with him. The ramparts themselves had only just had their foundations laid at the death of Louis IX and were completed at the beginning of the fourteenth century. His son had continued the work but went to war against the Kings of Aragon, at which point the Catalans took control of the coast of the Languedoc. The walls are 1634 metres long, will take an hour to walk around and it is recommended that you save your walk for later in the day once the heat has subsided, if you are visiting in the summer months. You can also get great views at sunset. Aigues-Mortes is also the setting off point for discovery of one of the economic strengths of the area: salt production. This may not be the first thing you would think of visiting, but a bus trip through the salt fields will provide you with amazing views of salt mountains, red-tinged salt flats and an insight into how an essential ingredient of your kitchen is produced. The salt was originally collected by the monks of the Psalmody Abbey, the remains of which can be seen at Saint Laurent D’Aigouze. Today the Salins occupy 10,800 hectares of land where water is pumped from lake to lake over 5 months. The water grows increasingly concentrated until crystallisation of the salt occurs. It is then collected and stored in a huge mountain or dune which is over 20 metres high and 400 metres long. The cream of the salt, the first layer, is collected by workers wearing white Wellington boots who use only wooden utensils to gather the precious, gourmet ingredient. It is coarse, natural and sold in boxes with the name of the person who has harvested it. You will find it on the table in good restaurants. On a geographical level, the gradually changing landscape due to silt brought down the Rhône river, has had a huge impact on the area’s economy. The port was at one point found 2 km south of the town and had to be linked by canal to the town in the fifteenth century. François the First dug the canal de Peccais in 1532 to link the Salins to the sea, but even this became cut off. The Canal du Grau du Roi now links Aigues-Mortes to the sea. The creation of the Canal du Rhône à Sète finally made it a river port as well, and you can not only take a day trip into the surrounding lagoons, but set off towards the Canal du Midi from this point. 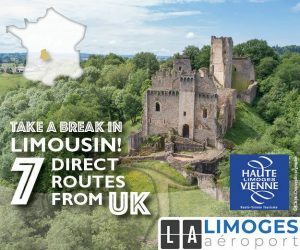 • Visit the Eglise Notre Dame des Sablons, dating to 1183, and recorded as the place where Louis IX prayed before setting off on his crusade. Also sacked by the protestants in 1575. • Discover the Camargue by boat – from the port opposite the Tour de Constance. Disover flamingos, birds and stop over at a bull farm for a traditional display of horse-riding skills. • Take a tour of the town by little train, with written commentaries available in English/German/Spanish/Dutch. Find out more by visiting the Aigues-Mortes tourism office website.